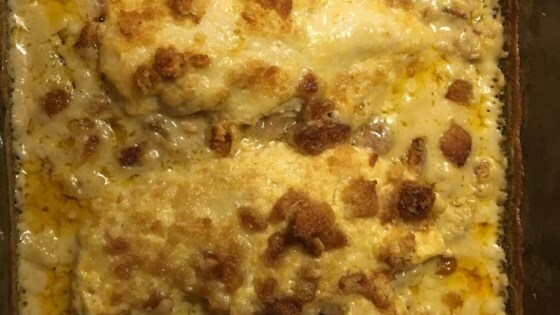 "Chicken breasts topped with Swiss cheese and baked in a creamy white wine sauce. I made this dinner for my senior prom date almost 20 years ago. She is but a distant memory, while this chicken dish is a HIT when I have the men over for dinner parties! If desired, serve with mixed greens tossed with pecans, a fruit vinaigrette and crumbled blue cheese. Add herbed egg noodles and a crusty bread, and you've got a meal made in heaven!" Arrange chicken in a lightly greased 9x13 inch baking dish. In a medium bowl, combine the soup, wine, garlic powder, cayenne pepper, mustard seed and sour cream and blend together; set aside. Top each chicken breast with a slice of Swiss cheese and pour sour cream mixture evenly over the chicken. Crush the bag of croutons and sprinkle evenly over all, then drizzle with melted butter. Bake at 350 degrees F (175 degrees C) for 50 minutes, or until chicken is cooked through and juices run clear. I have made this several times,I do cut back on the wine some.This is very easy to make & tastes wonderful!!! AWESOME, IF YOUR BROWSING THROUGH CHICKEN RECEIPE'S CHOOSE THIS ONE!! !